The sheer proliferation of newly published research articles can make staying on top of the literature a daunting, time-consuming task. Moreover, not being a deadline-driven activity, it can also fall down lists of priorities and be difficult to integrate into the everyday routine. Erzsébet Czifra-Tóth and Jon Tennant have put together a short sequence of steps and flagged a number of freely available online tools that will help researchers to easily integrate an effective literature review and discovery routine into their work lives. These include refined search and discovery options and a number of customised, organised alerts. Literature review is a crucial aspect of scientific work, with every single published research paper requiring one as part of its introduction. Every grad student will spend much of their time critically analysing research articles as the basis for their thesis. Keeping up with the literature is a way of keeping up with the evolving nature of discovery, and something every researcher must do. Still, for many researchers, staying on top of the rapidly growing body of literature can be a daunting and time-consuming task, and difficult to integrate into the everyday routine. Not being an urgent, deadline-driven activity, regular literature review often lands on the bottom of to-do lists, and it is easy to fall off the tracks. Added to this, with more than 2 million research papers published each year, researchers are drowning in a sea of new content, from an ever-increasing number of sources. There are around 28,000 journals out there, and new ones popping up all the time. Besides the acquisition of superpowers, how are you supposed to efficiently stay on top of all this? This dilemma is emphasised in the era of digital publishing when the power of established, high-impact factor journal brands is becoming less important for selectivity compared to article-level metrics and individual judgments. In this dynamically changing environment of scientific communication, keeping an open mind and providing critical evaluation of the literature have never been more important. At ScienceOpen, we’re helping to solve this problem of information overload by offering ways for you to efficiently stay on top of the published record. By following the three simple steps below, you can easily integrate an effective literature review and discovery routine into your research life, and save time for more important things like research and drinking coffee. Research is all about discovery. Recently, we launched a new range of powerful, dynamic, multi-level search and discovery options using our state-of-the-art technology. These include a new filter for content “indexed in the last X days/weeks/months” on the platform, and “publication date in the last X days/weeks/months”. Together, these make it super easy to keep track of the newest articles as well as our latest additions, all of which can be sorted by publication date in any search. In the course of the daily aggregation, we bring together research articles from across more than 3,300 publishers and 26,000 journals and integrate these into one community space. Good luck doing that manually. We harvest all the new content from PubMed, PubMed Central and arXiv every day. Preprints from arXiv keep you right up to date as they allow you to read the latest results from your field before the publishing stage. We aggregate thousands of new articles each day by working closely with our publisher partners and our DOAJ-partnered indexing competition winners. We also integrate new content from our users and collection editors through either ORCID automation or submission of a list of DOIs (or from Endnote, Zotero, and Mendeley) which we can use to pull in content from CrossRef (if we don’t already have it). RSS feeds containing DOIs enable us to integrate the latest articles from across different fields and publishers, including Equinox, Oxford University Press, Springer Nature, Sage and Science. As a next step, by combining our 16 search filters, you can easily design your very own search and create a reader for yourself, covering your precise range of research interests. Our enhanced semantic search possibilities help you to easily browse through our recent additions and find the most relevant pieces without feeling too overwhelmed. Most importantly, you can select to retain these as a “saved search”, and gain real-time updates as new content is integrated into our platform. We’re growing at around 1 million article records a month at the moment, so you don’t want to miss out! We’re also aware that you don’t always have time to read or even browse through all the results in one go. With ScienceOpen, you can easily turn these feeds into your very own researcher-led collection to share them with your research community. One important feature of saving your search queries is that we keep them up-to-date automatically while you’re off doing other things. 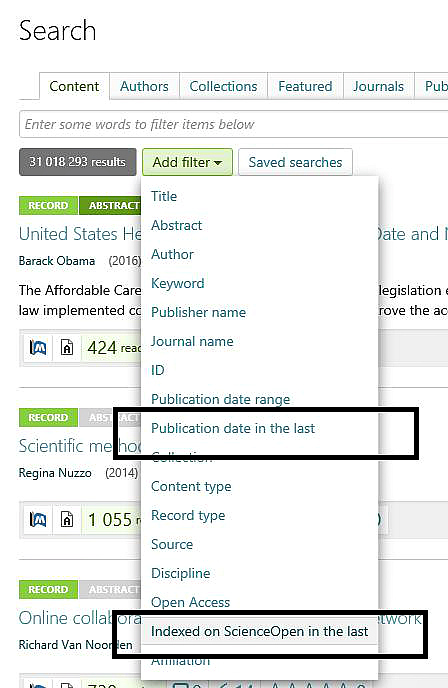 The next time you visit ScienceOpen, all you have to do is open your saved searches and see what’s new. To make it a habit, you just have to set a dedicated discovery time – say, once a day or once a week. Use this as a chance to regularly top up on your inspiration! How do we do this at ScienceOpen? Well, we all come from research backgrounds and like to stay on top of our individual fields; from German literature and cultural linguistics, through to particle physics and dinosaurs. We find that a pretty great time for this is Monday morning – start your week by getting the latest from your field with ScienceOpen’s automatic delivery service. Create a Google Scholar alert based on keywords, field, or authors. This is the best way of getting constant updates of everything Google Scholar finds, including from what might be considered “obscure” sources. Use Feedly RSS feeds. You can create RSS feeds for a huge number of journals, blogs, news feeds, or even PubMed searches. Feedly integrates and organises them all in one place. It updates in real time as new content is published, so you can have everything you like in one place, as long as you gather the feed for it. Twitter. This is where researchers often share the most interesting new research. You can set up alerts too for people who constantly tweet new material, making sure never to miss anything. It’s not stalking, it’s efficiency. Create or join a listserv. If you’re still a bit fond of the 90s, listservs are a great way of sending or receiving weekly digests of relevant research published in your field. All of these provide digital solutions to an information overload problem. At ScienceOpen, our mission is to use web technologies to make things as easy as possible for researchers to do their jobs well. This blog post is an amalgamated, edited version of the authors’ articles that originally appeared on the ScienceOpen and Green Tea and Velociraptors websites respectively. Featured image credit: Library Books from StockSnap (CC0 public domain) via Pixabay. Erzsébet Tóth-Czifra is about to finish her PhD in Cultural Linguistics at the Eötvös Loránd University, Budapest, where she explores corpus methods in linguistics and investigates the evolution of Hungarian word-formation schemas. Her commitment to democracy in science led her to join ScienceOpen where she works as Content Integration Manager. Before joining the ScienceOpen team, she was a guest lecturer at the Eötvös Loránd University, Budapest and at the Fachhochschule Burgenland in Eisenstadt. She writes for the ScienceOpen blog and tweets @etothczifra. Jon Tennant completed his PhD at Imperial College London and his research looks at deep time evolutionary patterns in groups like dinosaurs and crocodiles. Alongside this, he currently works as a PLOS Paleo Community Editor, is Communications Director for ScienceOpen, a freelance science writer, and author of the kids’ dinosaur book Excavate Dinosaurs! He can be found on Twitter at @Protohedgehog, talking about open access.